Canby residents didn't hold back at the lively Civic Block Visioning Forum, letting developers, council members, city economic officials and Chamber of Commerce officers know that they want to see a dynamic downtown area that offers something for toddlers to seniors and everyone in between. Prior to the meeting as many as 75 people gathered to view signs around a room in the not-yet rented lower floor of the Dahlia that included titles such as favorite small businesses in Canby, downtown canby objectives, what businesses does downtown need, how often do you visit a thriving downtown canby, and three asking how much money per month do you spend at small businesses in Canby, Oregon City and Wilsonville. Most people took out their pens to answer these questions. 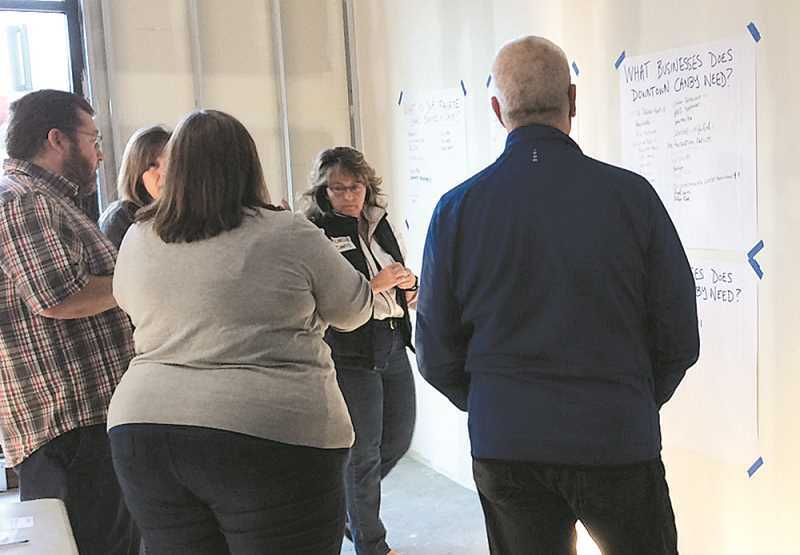 From a long list of business needs to overall objectives for Canby's current downtown, attendees offered their thoughts on what they preferred. After a short meet, greet and eat, people gathered in chairs and quietly listened to the presentation until Chamber of Commerce Executive Director Kyle Lang started asking questions. Lang first introduced the people behind the forum including developer Mary Hanlon, whose idea made the Dahlia into reality. Calvin LeSuer, the city's economic development and tourism coordinator and Hanlon Development's Meredith Goddard. They all gave short speeches about increasing small businesses in the Dahlia Block area and what they hoped to see in the future. "We want to help make people's ideas reality," said Hanlon. Lang introduced Mallory Gwynn who talked about Canby's downtown "Back in the Day," and explained what he and his daughters went through to open the often lively coffee shop. "The streets were full of people and all the small businesses worked collectively. They made it easy to shop. Big businesses can't do what small businesses can (do together)," Gwynn said. He also noted that people still really want and desire the human experience, "…small businesses prove it. Small businesses that work together create such environments and make it so attractive that people can't stay away. You can't duplicate a human business owner. If you love the customers and serve them well, your business will thrive," Gwynn said. Lang then opened the meeting for business by asking those attending what they would like to see? That list was long, but before many could answer someone brought up the lack of parking, the speakers quickly moved off that topic. While it is important, they suggested that negative things will stop downtown's growth. If there's something specific people want and its downtown they will go, said one member of the audience. "There's no parking problem yet, let's make parking a problem," said Gwynn. Meanwhile, the list continued to grow. One young mother noted that it's hard to find things to do with small, younger children, while others mentioned 'tween and teenagers need activities to keep them from finding their dark sides. Others suggested eateries from fine restaurants and places to go after a movie or a night out for families besides pizza places, places with an extra room for end-of-season teams and a number asked for wine bars. Most people would like to see a bowling alley, another movie theater, franchise stores, sports stores and activities, ice skating, splash pads, and a community center. Still others talked about art galleries or museums. It was a long list and quite exciting. Yet others want to see bakeries, ice cream shops, laser tag, gift shops, jewelry stores, pet shops, boutiques and more. "The next time you're in Newberg (or McMinnville) talk to a small business owner and ask if he knows anyone who is looking to expand. He'll talk to his fellow business owners and that could spur others to start a business here," Lang said as a final gesture. Finally, residents were reminded of the Boot Camp scheduled for Saturday, Nov. 3 and Sunday Nov. 4 to activate and elevate small businesses in the downtown core.